Is the Restaurant Recession Over? The so-called restaurant recession has taken a toll on many chains in the last few months. Is it time for investors to call a bottom? 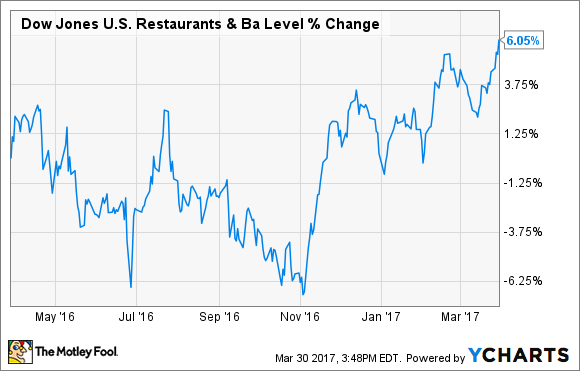 Last fall, the U.S. restaurant industry hit a wall of worry it has so far been unable to climb. Foot traffic went into retreat, and profits at many chains followed suit. Six months into the so-called "restaurant recession," the news has yet to show that the industry is on the mend. Total sales at restaurants have enjoyed strong growth ever since the Great Recession, and 2016 was no exception. Driven by a combination of increasingly confident consumers and steady growth in new restaurant locations, Americans' hunger for meals outside of the home has been impressive. Menu prices have also been on the rise, helping boost the figures further. Spending was up nearly 6% in 2016 compared to the previous year. Chart by author. Data source: U.S. Census Bureau's Monthly Retail Sales Report. 2017 is off to a similar start, with total sales up 2.4% compared with the first couple of months last year. While those positive figures are a good sign the economy is still growing, they can also be deceiving. Overall sales are up, but foot traffic at individual restaurant locations is shrinking at the fastest rate and over the longest period since 2009. During the third and fourth quarters of 2016, same-store sales (which accounts for traffic and average ticket size) declined 1.1% and 2.4%, respectively, according to TDn2K's monthly restaurant report. Comparable sales were flat and down 3.7% in January and February, respectively, to kick off 2017. A number of issues like falling prices at the grocery store and the rising cost of necessities like rent and healthcare have been blamed for keeping people at home rather than dining out. But that isn't the main culprit, because nationwide sales are still on the rise. The numbers point to one key item being the primary problem: too many new restaurant openings fighting over limited growth in eating-out budgets. This is a common problem when an industry experiences strong demand growth. Supply is increased to keep up with growing appetites, and if that appetite suddenly slows down, suppliers can find themselves running off of a cliff. The global oil industry found itself in a similar situation back in 2014, and it seems U.S. restaurants are experiencing it now. Chart by author. Data sources: Shake Shack, Zoe's Kitchen, and Chipotle fourth-quarter 2016 earnings reports. There might be light at the end of the tunnel, though, as business is expected to improve in the year ahead. Rising wages and continued improvement in employment could help put a floor under traffic declines. After all, when households get a raise, one of the items in the family budget that gets a quick boost is eating out. Restaurants could also get a bump in profitability in 2017 as strong wage and benefits increases paid to employees in the last year could begin to abate. While wages aren't going down, they are expected to grow at a slower rate than last year. Other benefits paid, like healthcare insurance premiums, have already been accounted for in many restaurant chain business models, so the impact there is also expected to slow. .
As a result of that improved outlook, restaurant stocks overall have rebounded. Dow Jones US Restaurant and Bars Index. Data by YCharts. General consensus is that foot traffic at fast-food and casual sit-down chains will suffer at the expense of the growing fast-casual space this year, a trend that has been in force for several years now. U.S. consumers want convenience, but not at the expense of food quality. Fast-casual is a sector to watch.